Yesterday I had an MRI. I’m typically not scared of anything medical. I can get my blood drawn with the best of them. I use to give plasma twice a week in college for some spare change. I started to have a slight panic attack the yesterday morning when I realized that I had never had an MRI, I was going alone, and I had no idea what it entailed. All I knew was that they kept asking if I had metal in my body and all sorts of other weird questions. Naturally I freaked myself out even more by researching on the grant ole internet for what an MRI was like. Bad idea. Very bad idea. One site told me it could be up to 2 hours. Another told me they could inject me with liquid that would cause nausea, diarrhea, and all those other lovely side effects. So I travel to see my sister and littles (who left me for a week to head to Florida to see the cute mice and princesses) and ask my sister what she knows. She tells me what she knows. Calms me a bit. And a I head out the door to the dreaded office to get this crap over with. Lucky for me the ladies in the office were super sweet and somewhat soothing. She offered me a washcloth to cover my eyes. Asked me if I was claustrophobic. To which I replied, “No.” From now on I will change my answer to, “Yes.” I may not be claustrophobic in an elevator but I most certainly am in that machine. This is the visual I had below the washcloth…. 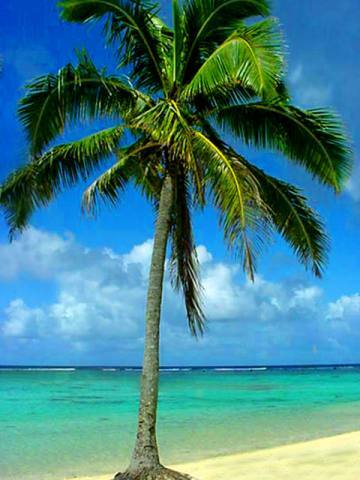 Seeing palm trees would make most people relax. But as soon as those extremely LOUD noises started I was done for. I felt like there was no air to breath. Full fledged panic attack, but without the outburst. I had a 20 minute panic attack in that thing and I’m not ashamed to admit it. It was a quiet one. I felt like I handled myself really well. I found myself gasping for air as best I could without moving. I knew if I moved I would have to start the whole process over and I just wanted to be done. So I finished. They slid me out and I practically jumped off that table to get out. I think I did a pretty good job of covering up how absolutely freaked out I was. Hopefully I never have to do that again. And just so ya know, I’m just trying to figure out why I’m having this awful lower back/hip pain. It’s been going on for about a month and working out just makes it feel worse. I was wanting to do two races this fall/winter and actually RUN them but as soon as I started wogging to get training the pain just got increasingly worse. I think it all stems from an accident many years ago and probably poor use of my back in general. Hopefully the news will be good and some simple physical therapy will be all I need to get back on the road of becoming a certified professional wogger. I WOULD HAVE GONE WITH YOU! Don't ever go to a scary appointment alone, ever, ever, again! Kapeesh! I am praying for you! Love you!